I'm always fascinated with the new ways we can show up in our health & self-care routine. This is what lead me to dry skin brushing - a concept I had NO idea about until I read a little blurb on it, which instantly captivated me. This was going to be yet another way I could truly focus on living out a beautiful, glowing lifestyle with one simple addition! If you're unfamiliar with this whole concept, then you've come to the right place. Because I am just an ordinary mom trying to up-level her health when she can, and I love that this is a very simple way to do it. It requires only a couple minutes a day - so are you ready?! What is dry skin brushing? It's a method of brushing your skin with a special brush (more on that below) to get the lymphatic system going by stimulating it. When you think about it, your skin is your largest organ, so it deserve precious care. Dry skin brushing not only helps cleanse the body, but helps unclog our pores (ie: since toxins are eliminate through the skin which requires cleared pores ;) & excrete any of those toxins causing havoc in our bodies. You use a special tool called a dry skin brush (I use one very similar to this as a short handle option and one like this as a long handle option). Just make sure it comes with natural bristle! Plus, the handle comes in handy for reaching your whole body! How do I dry skin brush (in simple steps)? 1. Get naked (ooo lala!) & step into your shower or tub. This way any dead skin that gets removed in the brushing process is contained in the shower or tub (gross, I know, but it's the truth!). 2. 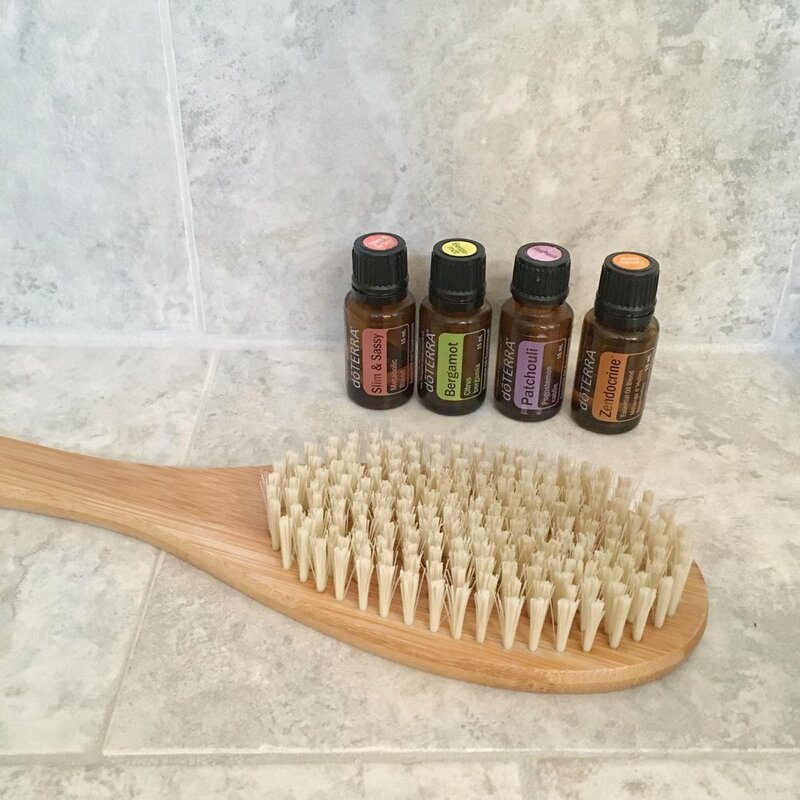 If you're using essential oils, add a few drops of an oil to your brush. My faves to add are: cedarwood, myrrh or zendocrine (the detox blend), patchouli, pink pepper, bergamot, and slim & sassy (the metabolic blend). I only select one oil per use. I prefer #1 myself, but this choice is up to you! You'll want to sweep/brush over the area a couple times before moving to the next. 4. When done, rinse your brush off then hop in the shower/bath! 5. Post-shower, use some unscented lotion (doTERRA's is my fave with a drop of eo in it) or an body oil. I love baobab for this - and slather on the body! What are the benefits to dry skin brushing? For me - the benefits below were BIG sellers & why I knew I needed to start this new ritual. Remember how I mentioned above that your skin is your largest organ + a main way to detox the bod? Well, dry skin brushing is an amazing way to stimulate the lymphatic system & kick it into gear. You'll get your circulation going & help express the toxins from the body better. It also is amazing for removing dead skin cells (the gross part), but your skin will become SO marvelous & smooth, as a result. And what about that cellulite that no one loves? It's amazing for, again, helping with circulation and unclogging those pores to help it breathe better. This is why I take eeeextra care in brushing around the upper legs & bum area ;) It’s also why I love putting a drop of slim & sassy on my brush (as I switch up the oils) because it helps with this issue also. So, take the few mins before you pop into the shower to do this simple, but truly glowing self-care ritual to lead you to a natural + rocking lifestyle. Try it out for 30 days. Just enough time to make it start sticking as a habit & show you how beneficial it is to your skin. Have I convinced you? Is this something you're going to add to your glowing self-care routine soon? Leave any comments or questions below and happy brushing!